You've probably heard at least a little bit about the big Rezone Albany project, which is working to completely overhaul and modernize the city's zoning code. The process is nearing its completion, and as that approaches, people are starting to get a sense of what sorts of changes the project might prompt. One that's getting a lot of attention is the zoning designations for parts of Lark Street between Madison and Washington and adjacent areas of neighborhoods there. Specifically, the new "mixed-use neighborhood center" designation along parts of Madison, Lark, and Washington will eventually require businesses to close by 2 am. And the "mixed-use neighborhood edge" designation for zones around the area will eventually require an 11 pm closing time. Those proposed new rules have prompted an online petition opposing the closing times -- it's already collected more than 2,000 supporters. And in a post at Medium, Joe Bonilla of the local PR firm Relentless Awareness argues the change will put Lark Street businesses at a competitive disadvantage compared to businesses in other parts of the city -- and put Albany itself at a disadvantage compared to Troy and other urban centers in the region: "This is not just a late-night bar thing. This is a dimming of the quality of life of living and working in an urban neighborhood." Over at the Times Union, Amanda Fries talked with some of the business owners who would be affected, and some of the neighborhood groups that seem generally supportive of the change. 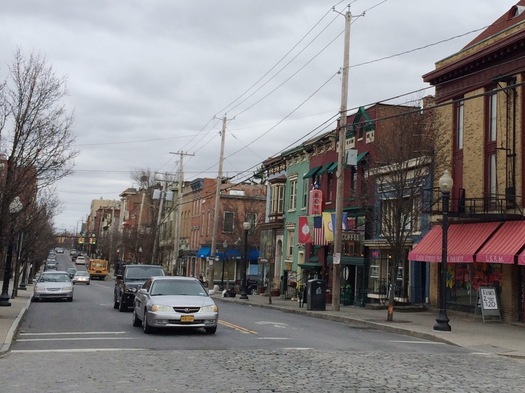 One of the goals of Rezone Albany is to simplify the city's zoning and make it more consistent -- something the current situation around the Lark Street neighborhood is not. Businesses that want to operate past 11 pm are required to get a special use permit from the city's Board of Zoning Appeals, a process that can take time and be tricky to navigate. The Rezone plan would also expand the number of properties zoned commercial to reflect the actual mixed-use nature of the neighborhood, and would allow some businesses to expand to the upper floors of buildings. If you zoom out a bit, this new debate about the potential Rezone changes is part of the ongoing discussion of what the Lark Street area is and/or should be. Is it an all-hours commercial and entertainment district? Or is it something more like a commercial center that serves a residential neighborhood? Can it be both? People have had a lot of different answers to these questions in the past, and they'll continue to have different opinions in the future. So the big, over-arching question is how to balance all these desires and concerns. If you'd like to weigh in on this most recent point of discussion, it's worth reaching out to your Common Council member with a comment. Or, if you can, take the time to show up at a Common Council meeting and say something during the public comment period. And if there ends up being another Rezone Albany public meeting about the final set of zoning codes, that would be another opportunity to show up and say something. Considering the enormous economic benefit that the student population provides to Albany, I think it's only fair to throw them a bone and offer some sort of nightlife district. To hamstring Albany's entertainment potential even more than already has been done is a mistake. Consider the vacant storefronts on Lark. Who would invest in a new business there with rampant NIMBYism in the nrighborhood? It's already a stretch to call Lark Street cool or vibrant. I really hope something happens with albany. It's the capital of New York and all it has to show is segregated old crumbling neighborhoods with small places to eat sprinkled in. If you don't believe me just go to washington ave and larkstreet go towards Madison and it's a pretty nice low key lark street, now on the same lark street just go towards Clinton ave... exactly. More needs to be with the whole city of albany because while there a very little pockets of nice places to go it has a surrounding issue of poverty and a crumbling city structure. I'm glad Troy is getting the message. I for one am glad that the city is clamping down on the shameful purchasing of pizza and toilet paper after 2am. The recent article in the Times Union about Lark Street made it seem as though the only businesses on Lark are late night businesses. This is far from true. The late night businesses make up a very small portion of the business on Lark. Having said that, I still want the bars and late night food operations to do well. We do not want Lark Street to be dark. I am in favor of re-zoning the street to create more retail space. Its hard to make a go at retail in these very small spaces which are so limiting. I am in favor of 2:00 closing time as long as it is applied to the entire city with a multi-year phase in. I think the late night establishments would do better if the area was more vibrant and diverse. Instead of there only being a few bars open at night, we need shops and restaurants to populate the street as well. Instead of trying to hold on to a fading business model, we need to embrace a broader more dynamic approach that will be good for both the business community and the neighborhoods alike. Mike, there are a few cute restaurants going in to downtown Troy, but the situation you describe is much worse there than in Albany. This is just an example of the current Mayor and City Council's clueless business skills. They've run the city into deep red debt, and punished citizens in the Lark street district with increase taxes on properties and trash, all while taking away the entertainment part that makes the area what it is. They only fix for Lark Street is to fire them all election time, and put a pro business Mayor and Council in office. It makes me sick to see Sheehan at business ribbon cuttings which she had ZERO impact with.